The KitchenAid KSB560 blender is a great family sized smoothie maker and blender which combines a great performance with the durability and ease of cleaning which KitchenAid has become famous for. You will find that this machine can comfortably cope with all your blending and pureeing tasks including making soups and smoothies, crushing ice and blending frozen fruit ingredients without problems. The KitchenAid KSB560 offers practicality with versatility and is easy to use. It features a family-sized blender jar which has a capacity of 56 ounces (over one and a half liters) and is made of tough and shatter-resisting polycarbonate. The jar doubles as a serving pitcher and the fact that the jar itself is so light plus the fact that it has a soft grip handle ensuring that even smaller children can hold it confidently, even when full makes this product a joy to use. The whole pitcher can be put in the dishwasher with no need to take apart the stainless steel blade as the patented design means this is in one piece so there is nowhere for food to get trapped and harbour bacteria. The control pad is also really easy to clean as there are no separate buttons to trap food debris – just wipe with a soft cloth and you’re done! The blender is powered by a 0.9 HP motor which delivers powerful, fast and consistent blending and features what KitchenAid call “Intelli-Speed electronic controls. It also features a clever airflow system designed to keep the motor cool during operation. 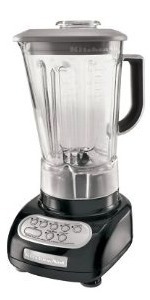 This blender comes with a 1 year replacement warranty from KitchenAid for your peace of mind when purchasing. This coupled with the fact that this machine is available at a great discount from Amazon right now (see link to product page below) and is available in a wide range of colors so you are sure to find one to co-ordinate with or complement your kitchen decor. It looks great on the counter top so there is no need to stow it away out of sight and the non-slip feet on the heavy metal base that ensures stability will not scratch your work surfaces! KitchenAid KSB560 blender in chrome, also available in red, tangerine, white, cinnamon and blue! 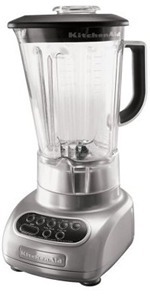 This blender has received an average four star rating from 467 customer reviews at the time of writing, with more than half of the reviewers giving this model, the maximum five star rating. One of the most popular features is the ice crushing facility. Just put the required amount of ice in the blender jar, press the ice-crush button and within a few seconds, job done! Another feature that customers particularly like is the Intelli-Speed function. What this does is adjust the power constantly so that the blending speed remains consistent throughout the smoothie making or pureeing process. This ensures that you get a perfectly smooth and creamy result every time. However, if you prefer to be more ‘hands on’, there are five speed settings to choose from and the instruction book will help you select the perfect speed for the items you are mixing as well as provide you with a good selection of recipe ideas if you need some inspiration. The polycarbonate jar also receives high praise, not only is it virtually unbreakable, but reviewers found it resistant to scratching which is very important from the hygiene point of view. For ease of use, it is highly rated, not only for the easy grip handle as mentioned above, but also for the cleverly designed spout which ensures drip-free pouring. Some early reviews of the KitchenAid KSB560 blender rated it low because of a design flaw that caused the jar to leak within the first few weeks of use. Kitchenaid have rectified this problem and later reviews make no mention of this – I think this is the main reason why the model does not achieve an almost perfect star rating – although an average four star rating is pretty impressive with this number of reviewers. Overall, this is a great family smoothie maker, ideal for the busy mom as the machine is quick and easy to clean, is powerful enough and has the capacity to blend a family sized quantity of smoothies or soups in one go – a great time saver. The price of the KitchenAid KSB560 is great too and this machine stacks up very well against higher priced models in terms of performance, durability and customer satisfaction. The link to your right takes you to the Amazon product page where the other colors are also available.